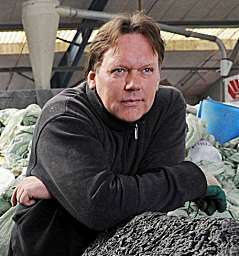 since 1987, jan eric visser has been transforming his inorganic household refuse into autonomous works of art. his sculptures are the result of a simple yet effective process, creating new shapes by assembling waste materials and wrapping them in waste paper pulp. once impregnated with wax and softly polished, the objects take on a new identity. though the shapes may look vaguely familiar, they never lose their enigmatic character. visser's working method opens the door widely to formal diversity. however, the forms are hardly ever anticipated. although the garbage - found in his bin, or incidentally gathered outside - is always the guiding principle, the artwork more or less emerges from the waste, presenting itself to the artist. visser likes to refer to this procedure as "form follows garbage". trying hard to keep up with the pace of his bin filling up, visser considers his sculptures 'stages' in a continuous process. the works are separate entities appealing to the viewer's sensitivity to relate to the object, as well as to his or her readiness for making own associations. the artist himself considers his choice of material to be -a metaphor for the inability of mankind to truly comprehend anything-. for this reason, visser's works are hardly ever titled: ideally his work goes beyond the domain of language and its conditioned response. lately, also the transportation boxes become pedestals matching the sculptures. filled with inorganic garbage they have become an inherent feature of the work interacting with the sculpture. recently, jan eric visser realized two outdoor sculptures of assembled litter packaged in aquadyne. this new material of recycled waste plastic allows for the rooting of plants: even vegetables can be grown on it. the first of these works, aquadyne sculpture (2008), was shown by li edelkoort in museum 21_21 design sight in tokyo and design museum holon as part of her exhibition post fossil- excavating 21st century creation. the second one, roteb eco monument (2011), was commissioned by the city of rotterdam and realized in co-creation with some 80 workers of roteb, the municipal waste department.